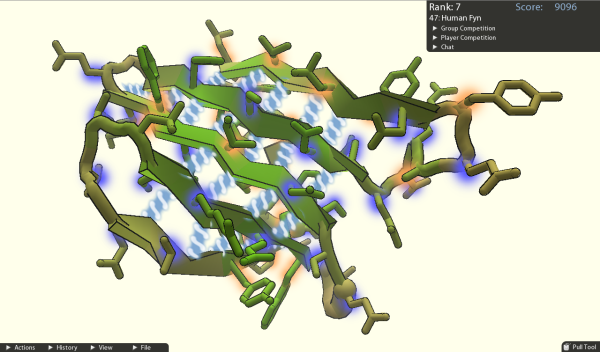 You know there’s been a paradigm shift in the world when complicated biomolecular problems are solved by gamers, as in the recent, much-reported case of an AIDS protein solution worked out by Foldit players in a crowdsourcing research challenge posed by scientists at the University of Washington. In the longrun, the most significant part of this remarkable story may be the experiment itself and the implications it has for the way we think about work and play, and how that might influence the way we approach future research challenges. UW computer game scientists and biochemists developed the online game Foldit to see if non-scientist gamers could be taught enough science and engaged long enough to work out a scientific problem. And it turns out they can. Posing research problems in game format recognizes that people who are engaged in “play” are able to sustain focus and interest for long periods of time. While there is no shortage of computer time or sophistication, it is recognized that the human reasoning component, especially involving spatial problems, is uniquely valuable. Computers are most useful when they adapt to human learning patterns. So, does the success of the Foldit challenge in deciphering the HIV molecule tell us more about how smart gamers are or how valuable the element of play is for scientists as well as (or at least as much as) “ordinary people”? I am very lucky to be working with wonderful colleagues on a fascinating problem: how to model biomolecular systems with sufficient accuracy to enable the computation of the structures of the macromolecules which occur in nature from genomic sequences, and the design of a whole new world of macromolecules with new and useful functions... I spend almost all of my time wandering around the lab talking to people, enjoying the excitement of new results as they come in and trying to help troubleshoot projects that are not working. When I sense that I cannot ask anyone yet another time if anything interesting has happened in the past few hours I check the weekend mountain weather forecast, and then try again. Clearly being energized is an important part of being productive in scientific research. 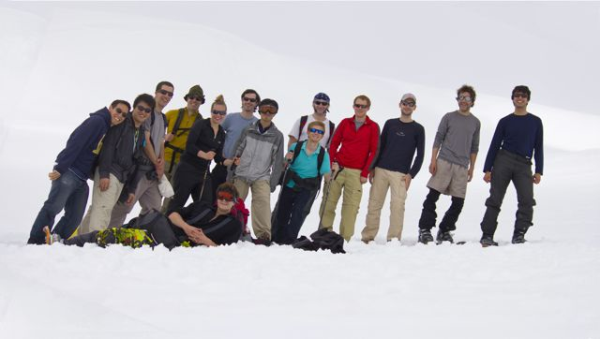 When these researchers are not finding what they want in the lab, they head to the mountains for stimulation and challenge. The mind and the body like to be engaged, perhaps not on such different planes. That researchers who check the weekend mountain weather forecast have created a way for gamers to solve scientific problems may not really come as a surprise. Scientists are not trying to be machines. They have machines. But real discovery in many cases needs a human mind with its curiosity and unique perception to solve complex problems. And the human mind needs to be stimulated for a lengthy period of time in order to solve these problems. Whether you call it play or work is a semantic distinction that may not really matter in the end. Gamers are not people who don’t want to work, and scientists are not people who fail to understand the importance of play. It may just be that the UW game scientists have hit upon a fundamental human drive to solve problems that fuzzies the distinction between the two in a very productive way. UW’s Foldit is a crowdsourcing research challenge not unlike those promoted by industry to solve complex problems and increase productivity of their technology (see our blog on Life Tech’s Crowdsourcing Challenge). If you are a scientist in the Seattle area interested in learning about new laboratory research products, sign up now to attend Biotechnology Calendar, Inc.'s Seattle BioResearch Product Faire event at UW, coming up on October 27, 2011. Laboratory equipment suppliers are invited to showcase their products and network with top university researchers in a professional, popular trade show environment. This is BCI's 22nd Semi-Annual show in Seattle on the University of Washington campus. To view the Seattle event flier and sign up to attend, click HERE.